Standing at a crossroads in the Mediterranean, the Balearic Islands are some of Europe’s most idyllic and captivating destinations for a luxury break. Indeed, you must be prepared to banish the cliché of islands solely dominated by brash resorts – the Balearics continue to lure a sizeable number of jet-setters and film stars, who head for luxurious but discreet hideaways in the hills. It is these chic resorts, attractive coves, and secluded beaches, combined with a benign, warm climate, that have made tourism the mainstay of life along the coasts of Mallorca, Ibiza, and Menorca. However, on tiny Formentera the pace of life is slow and the level of development minuscule. Visitors to these islands predominantly arrive with expectations of beautiful beaches, fantastic nightlife and remote hideaways where peace and quiet are mandatory, and never leave disappointed! Yet, what is less widely known is that the Balearics have a long and proud history of vine cultivation, stretching back hundreds of years. Historically, vines were planted at around 120BC by the Romans; the Philosopher, Pliny the Elder, is reported to have compared the island’s wines to Italy’s finest in the first century AD. Sadly, the advent of phylloxera in 1891 destroyed the island’s winemaking industry, although it has been resurgent over the past three decades. 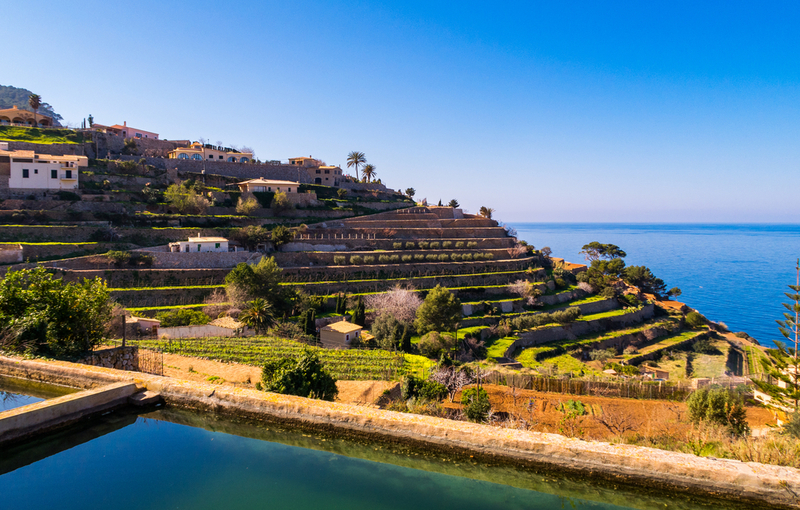 Today, the Balearics’ wine industry is experiencing a massive renaissance and continued investment has raised the quality and consistency of the wines to new levels. 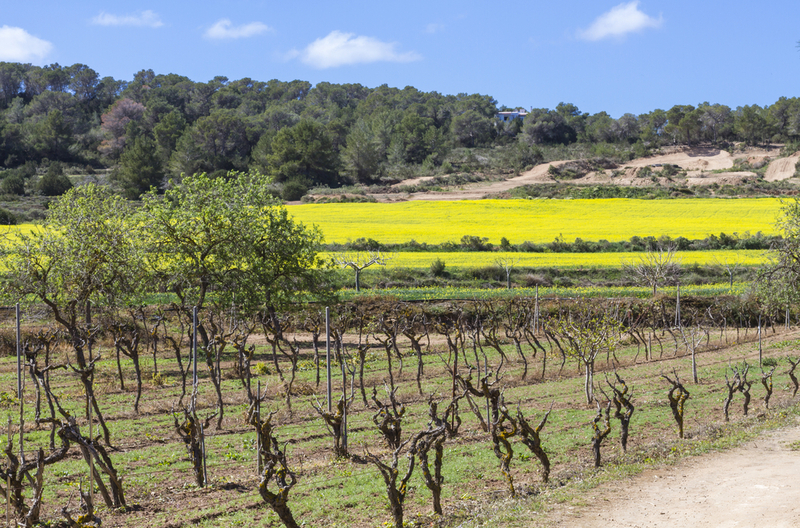 Each of the four Balearic Islands – Mallorca, Ibiza, Formentera, and Menorca – is in the business of making wine, although the only island with a sizeable industry is Mallorca and Formenteran wine remains a local curiosity. But, for wine lovers keen to learn more about these fascinating and unique wines, there are many treats in store. For a start, the vineyards of Mallorca, Ibiza, and Menorca are some of the most picturesque in Spain – grapes ripen in a benign sub-tropical climate and the landscape is spectacular. Vineyards cling to steep terraces on the island’s hills and olive, almond and citrus trees dot the fertile land. Your first port of call in Mallorca must surely be the region of Binissalem-Mallorca. 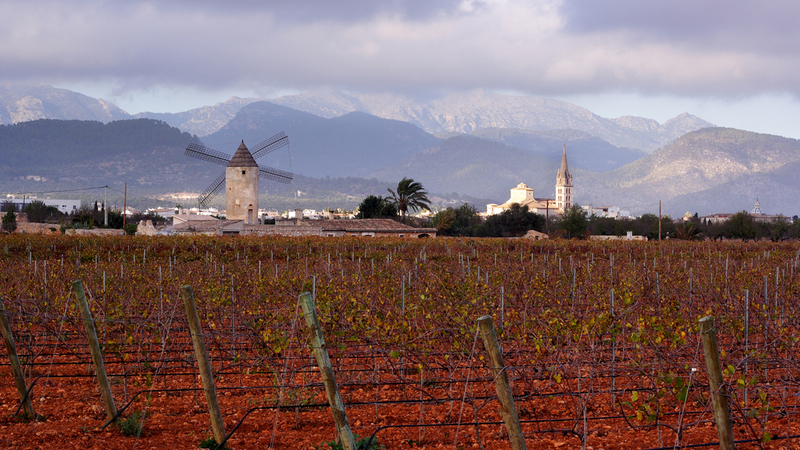 A relatively new Spanish appellation, the D.O was established in 1991 and now covers over 600 hectares of vineyards, located in the center of the island, north-east of the capital – Palma. The village itself is utterly charming; flanked by the Sierra de Alfaba mountain range, windmills dot the landscape with impunity, lending the region a certain fairytale air. There are several good wineries in the region, but for an unbeatable introduction to the wines of Binissalem, make sure to visit Vins Nadal. Founded in 1932 by Miquel Nadal Fiol, it is today one of Mallorca’s best wine estates, producing a range of modern, stylish wines from a mix of indigenous and international grape varieties. Moreover, they welcome visitors and are happy to answer any questions about Mallorca’s wine culture. After your visit and tasting, why not pop into Restaurante Celler Sa Vinya in Binissalem for a leisurely lunch. One of the village’s finest restaurants, Sa Vinya serves Mallorcan specialties such as fideua – the local paella made with noodles rather than rice- pork wrapped in cabbage and suckling pig. There’s a good selection of local wines too, and the service is spot on warm, friendly and very Mallorcan. After lunch, we’d suggest driving over to Pla I Llevant, Mallorca’s other important wine region. Situated on the south-eastern part of the island, the vineyards spread out in all directions from the districts of Felanitx and Manacor. However, before you head over to one of the region’s wineries, spare a thought for Felanitx, which remains one of the island’s prettiest small villages. For centuries it has been famous for the Els Cavallets dance, where young children, wearing white trousers, red tops and green hats dance around another child waving a handkerchief to the music, known as La Dama. Birthplace of the artist Miquel Barcelo, it is well worth spending an hour exploring its narrow medieval streets and beautiful 17th-century convent. In terms of wineries, the visitor is spoilt for choice, as Pla I Llevant is leading the vanguard for modern, extracted and powerful Mallorcan reds. Toni Gelabert is one of the leading lights in the region, a very talented man who founded a boutique winery in 1979 dedicated to biodynamic grape growing. Today, he cultivates 10 hectares of Cabernet Sauvignon, Merlot, Syrah, Callet and Pinot Noir. His standout Cuvee is the San Fangos, a remarkably aromatic and potent wine that begs to be served with roast suckling pig. Which, is one of the highlights at Es Molí d’en Bou, a wonderful restaurant situated in the chic resort of Sa Coma on the east coast. Easily accessible from the vineyards of Pla I Llevant, head chef Tomeu Caldentey is one of the island’s finest, offering modern interpretations of traditional dishes that showcase his innovative flavor and texture combinations. A true Mallorcan gem, you cannot leave the island without sampling Tomeu’s high-class cooking. Finish your Mallorcan adventure with a morning stroll along what is arguably the island’s most magical spot – Cala Llombards. It’s a little piece of tranquility on the southeast coast, a delightfully tourist free thin strip of white sand framed by pine trees. Paradise! There is much more to Ibiza than crowded resorts and thumping nightlife. Vines have been cultivated on this often misunderstood island for centuries; the Phoenician civilization planted the first vineyards on Ibiza, although no industry ever fully developed over the centuries and vine growing remained largely a hobby for the island. However, today there are a handful of producers making excellent wines on the west coast of Ibiza, working with about 30 hectares of vineyards. So after a leisurely breakfast, we’d suggest heading over to Bodega Sa Cova, owned by the charismatic Juan Bonet. His wines are undoubtedly the finest in Ibiza, particularly his Malvasia white which is fresh, well-balanced and very aromatic. Moreover, Bonet welcomes visitors and is a lively and enthusiastic ambassador for the wines of Ibiza. After your tasting, spend a few hours at our favorite beach – Cala Salada. It is surely one of the island’s most magical spots; surrounded by pine-forest hills, the turquoise waters of Cala Salada are utterly idyllic and yet largely unfrequented by tourists. Which is so much the better for a relaxing few hours strolling, sunbathing and swimming. Of course, no trip to Ibiza would be complete without a gastronomic feast, and we can think of no better destination than Sa Punta for a romantic evening, complete with spectacular views. The restaurant is to be found on the bay of Talamanca and boasts unrestricted views of Ibiza town and the Marina. Small wonder then that it has become a firm favorite with A-listers and discerning locals. The menu has an international slant, with fresh fish and superlative pasta and risotto dishes being the major highlights. In fact, the setting, service and wine list are all pretty perfect – one for that very special occasion. 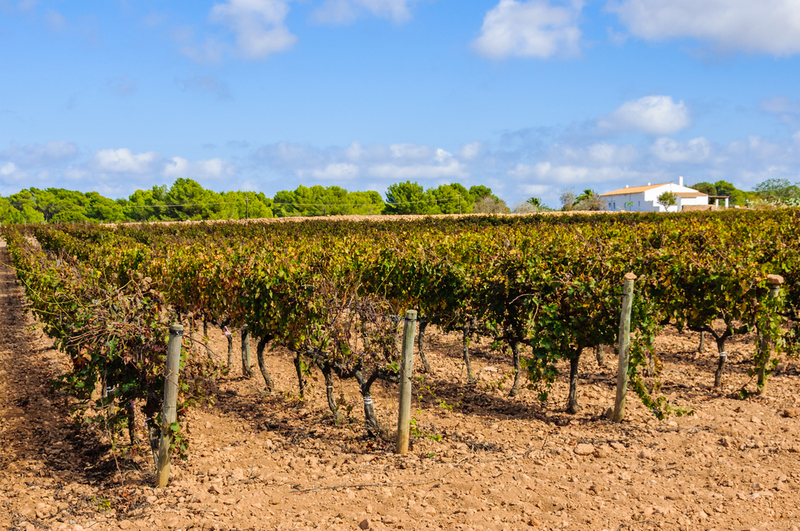 These two islands are really minor curiosities in terms of a wine visit, although both Menorca and Formentera have hidden surprises and reputable wineries, working with both local and indigenous varieties. The best by far is Formentera’s Cap de Barbaria, a boutique producer that has made a name for itself outside of Spain. Make sure to try their top red – Vi de la Terra de Formentera – a blend of Cabernet Sauvignon, Merlot, Monastrell and local Fogoneu. It typifies Balearic wine, with its concentrated palate, potent aromatics and very singular expression of the island’s unique terroir. The perfect end to your Balearic odyssey. Good round-up, thanks. It's always worth taking a closer look at resort-islands with big reputations. Turn left instead of right and you can have it mostly to yourself.